Autumn is melting into winter. After the burst of russet and gold the leaves are falling off, leaving the branches bare. Winters flowers are yet to bloom. Early morning chill prompts us to soak in the Sun before embarking on routine chores. 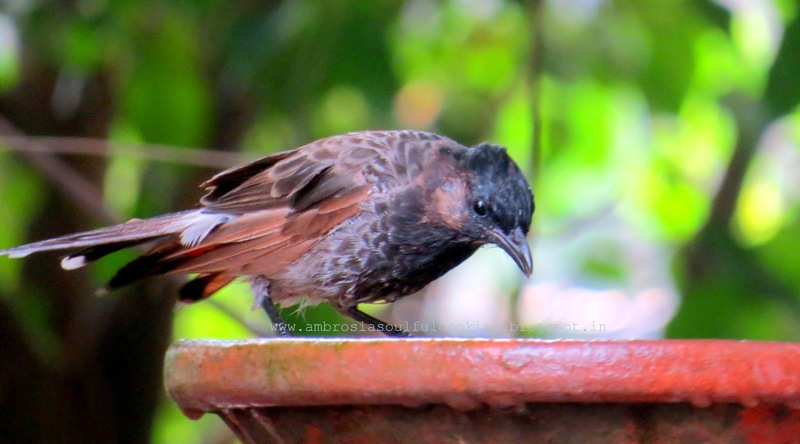 We spotted some Bulbuls yesterday. After pecking from the food table the flock flew noisily and perched in the big Jamun tree flitting from branch to branch preening themselves. One of them stayed back and bathed for a very long time. It seemed to be enjoying the cold water in the warmth of the Sun. The season asks for early and light dinner and we find thick soup with homemade bread an ideal combination. Yesterday, we had green pumpkin soup with Cornmeal Semolina Bread. 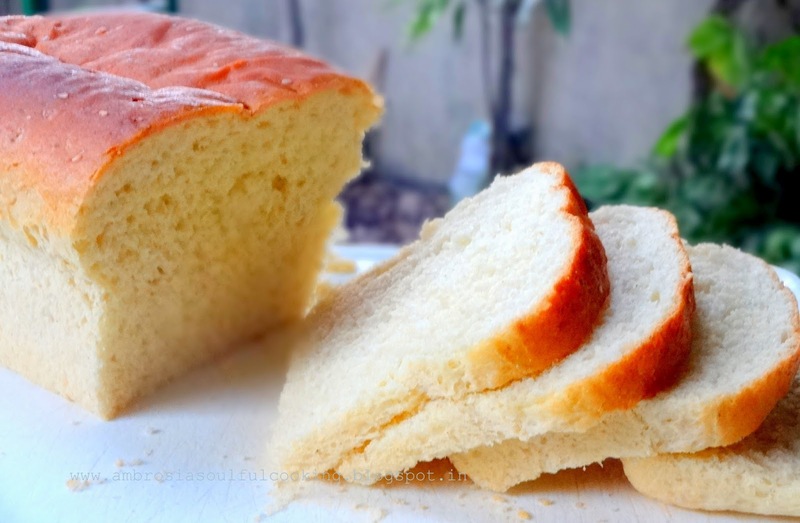 Semolina always gives breads a great texture. 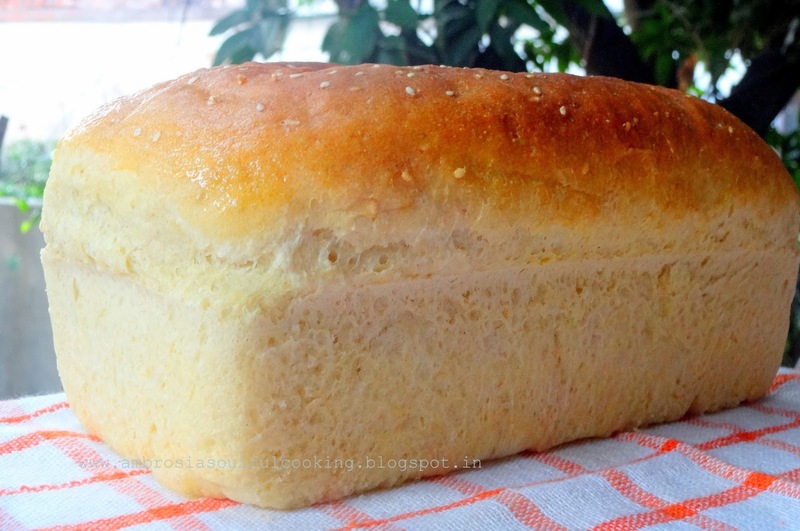 This bread asks for kneading for a long time with addition of water in small quantity till the grains drink water, swell up and become soft. In the beginning, the dough is hard and gritty but by the end of kneading for 6 to 8 minutes, it turns soft and elastic. In a large mixing bowl, combine all the ingredients (use only 1 cup water). Stir till the ingredients come together evenly and the dough begins to leave the sides of the bowl. Transfer the dough to a greased kneading plate, oil your hands and knead for 6 to 8 minutes. Keep adding water. 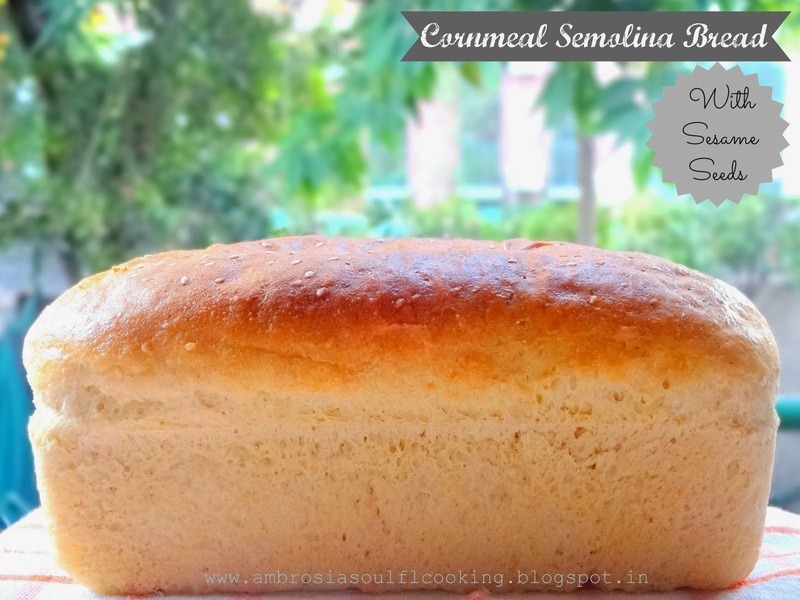 Semolina grains will absorb water and become soft. Knead till dough becomes smooth and supple. Transfer the dough to a grease d bowl. Cover with a kitchen towel or plastic wrap and allow the dough to rise for 1 hour. Grease one 8 ½ inch x 4 ½ inch loaf pan. Dust with cornmeal. Transfer the dough to a greased surface and form it into a loaf. Place the loaf in the prepared pan. Cover the pan and keep in warm place for I hour or until it crowns over the lip of the pan. Bake the bread in a preheated oven at 190 degrees C for 30 to 35 minutes or till the top turns brown. Remove from the oven after 5 minutes and from the pan after 5 minutes. Cool in the wire rack.